A list. A very short list, but an honest one. I'm thankful for my hanging succulent plants. Every time I look at them I think about how they started out as one small plant. I think about how we all have the potential for such abundant growth! I'm thankful for my patrons. The connections and friendships that are forming on Patreon literally keep me going every day. I'm thankful that dark chocolate exists. I'm thankful for my husband Jonathan who has the rare ability to think up creative ways to help me with my music career and who has believed in me from the beginning. I'm thankful for Simon the Cat who has a talent for being the perfect cuddly reprieve when I'm working too hard. I'm thankful for warm cups of tea and comfy clothes at the end of the day. I'm thankful for intermittent fasting, which keeps me healthy and grounded and feeling totally not guilty for the big Thanksgiving feast I'm about to it! I'm thankful for YOU. Thanks for spending some time on my website to read this post. I wasn’t always the ideal candidate to nurture life. In college my dorm was unimaginably messy, I regularly slept on a pile of clothes in lieu of a bed, and in the midst of all this, I managed to kill multiple cacti. I repeat, the easiest plants to keep alive: cacti. Maybe because of these failed attempts (as weak as they were), I resigned myself to thinking my thumb was not so much green as it was toxic, and didn’t really think about it much beyond this resignation. But years later, when I was moving into my first, very-own, all-to-myself apartment, I got the urge to buy some plants. It was kind of a weird sensation. Where is this coming from? I was at least willing to suspend my long-held allegations of horticulture incompetency just long enough to tantalize my intrigue. So one day I stopped to eat at The International Market on Belmont Blvd (one of Nashville’s most beloved places to eat good thai food for cheap,) and I saw they had these adorable succulent plants for sale to benefit flood victims. The perfect opportunity has arrived. My first encounter with succulent plants was when I was working a summer job in college as a Plant Waterer. Boredom reached pinnacle heights at this job. I’d combat the doldrums by writing songs and listening to tunes, but when I arrived at the succulent section, I could help but be mesmerized. The leaves on a succulent plant are like little pouches of water, delicately attached to the stem. It was so hard to resist the urge to touch them. Just to imagine the tactile sensation of these adorable pods of greenery was enough to keep me inspired throughout the day. 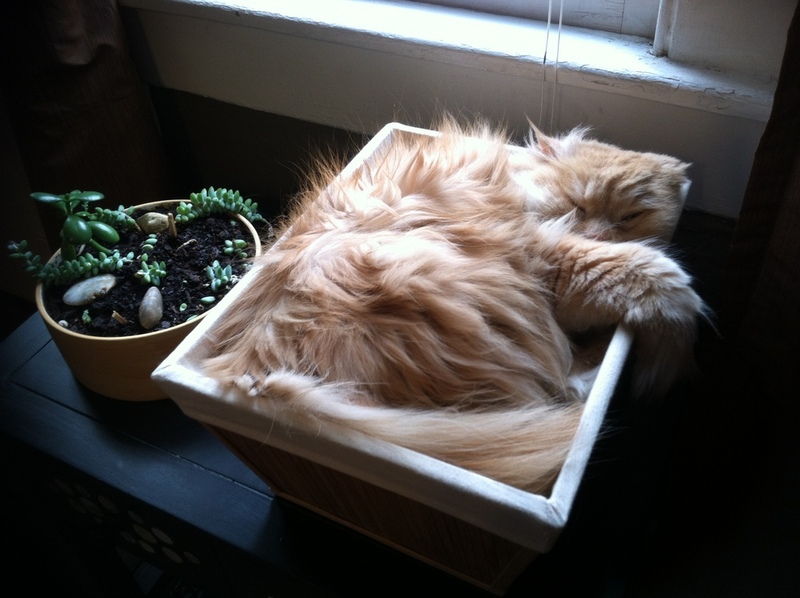 Simon the Cat, nestled up next to my succulent plant. So now I’ve owned my little plant for about a year and a half. Not only is it ridiculously easy to take care of in-door succulents (I’m making up for those poor cacti in my past) but I now notice an unexpected joy that rises up every time I see a sprout of new growth in my miniature potted garden. And I’m not kidding, I really did not expect to get so much joy out of this. I find myself fascinated again and again by these little spurts of life. Admiring a new spurt of life. When I take a closer look though, my joy is not “unexpected” at all. The word unexpected means surprise, unbenounced, out-of-the-blue. What’s out -of-the-blue about consist and daily nurturing? As I’ve watered the soil of my little plant, I did not know I’ve been watering my own emotional soil until, in a seemingly sudden burst, the bud has appeared. All at once I’ve realized how much happiness it brings me to take care of another living thing. I’ve learned that Joy is a slow and steady cultivation. As I apply this to the broader scope of my life and my music career (which takes a lot of SLOW and steady work!) I will remember that Unexpected Joy may take awhile to break through the soil - but it will. What is your Unexpected Joy in life right now?